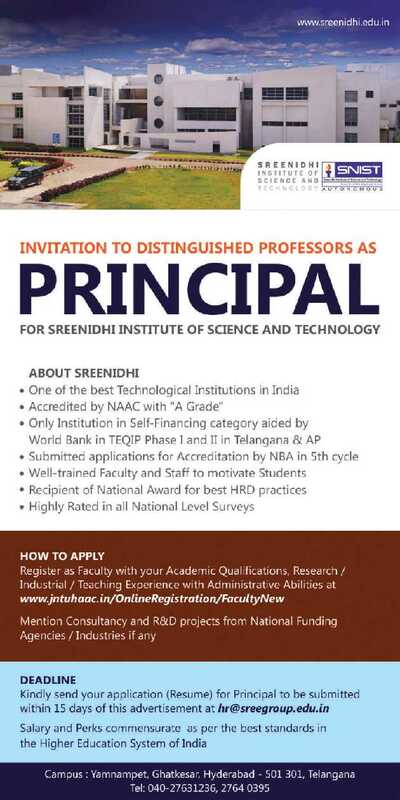 Sreenidhi Institute of Science and Technology, Hyderabad has advertised in THE HINDU newspaper for the recruitment of Principal job vacancy. Interested and eligible job aspirants are requested to apply within 15 days from 01st November 2017. Check out further more details below. About College: Sreenidhi transforms its students into technically competent, highly communicative and application oriented life long learning Engineers. Their success in the globally competitive technological world and leadership in their chosen profession, are our objectives. Ragging in Educational Institution is prohibited as per the Act of Andhra Pradesh Prohibition Act,1997. How to Apply: The candidates are required to register as Faculty with academic qualifications, research / industrial / teaching experience with administrative abilities at www.jntuhaac.in/OnlineRegistration/FacultyNew . Mention Consultancy and R & D Projects from National Funding Agencies / Industries if any. Then candidates should send the application with complete details in Resume to the following email address.